With another round of urban expansion at the door step, there will be increasing pressure on conversion of agricultural land for urban development. In view of Hong Kong’s limited land area, is it true that agriculture can only disappear in the foreseeable future? With increasing emphasis on sustainable development and quest for an alternative lifestyle, would better integration of agriculture activities in urban development provide answer to better management and utilisation of the rural and urban environment in Hong Kong? 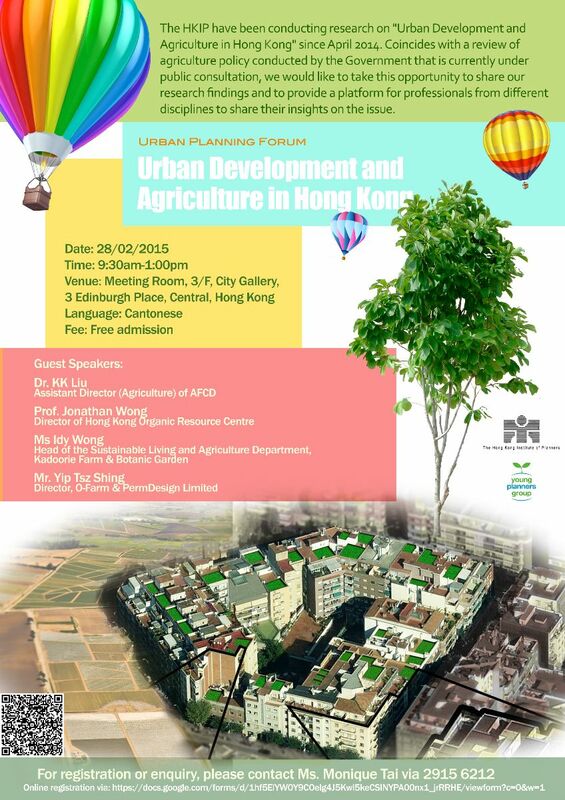 The Hong Kong Institute of Planners (HKIP) have been conducting a study on "Urban Development and Agriculture in Hong Kong" since April 2014. Coincides with a review of agriculture policy conducted by the Government that is currently under public consultation, we would like to take this opportunity to share our research findings and to provide a platform for professionals from different disciplines to share their insights on the issue.